Finding solutions to tough problems is not as hard as you think, especially when you understand Business Problem Topology. Roy H. Williams first taught me the concept of Business Problem Topology through his trilogy of "Wizard of Ads" books. Then he taught it to me again during a visit to Wizard Academy in May 2005. And when I applied it to a problem I had, it worked! Business Problem Topology is when you take a problem you are having and look where a problem with similar characteristics may have already been solved. Solomon tells us that there is nothing new under the sun. Therefore, any problem you have is nothing new. Someone once had a problem like it. I had a problem. Mine was hiring good people. In the toy business we hire a large number of temporary workers for the Christmas season. They need to be trained and ready to go in short order. For years I struggled with this problem - until I applied Business Problem Topology. My problem? Trying to create a finished product that was strong, useful and beautiful - a work of art - in a small window of time. I needed a process that consistently turned out a beautiful, useful finished product. So I asked myself... What art is consistently strong, useful and beautiful? 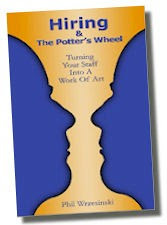 Now I have a book that shows you how to apply all of the steps of a potter to your hiring and training. It is an easy read. The nine steps I outline are told in a story about a young HR person named Mary hired by a start-up company that is experiencing growing pains. As Mary learns, so will you. And if you apply these same techniques in your business, you'll see a huge change in the quality and skills of the people you hire and train. I know. I use it every day. It's my dirty little secret for having awesome customer service. And I'm sharing it with you. Stand Up and Be Accounted!